On behalf of many of our clients, we are pleased to report that nearly all of our projects located adjacent to or within the recent wildfire zones in Northern California have survived. Two strawbale projects in particular were directly in the line of fire, and both survived. The first is the Redwood Valley Residence (pictured above), where the owner and his dog were awoken by an orange glow out the window. They left in his truck to make an escape to the valley floor, along with a neighbor they met on long driveway, but at that moment his well pump house burst into flames, blocking the drive, so they retreated to the house which held them safe until dawn. All of the surrounding landscape, trees, outbuildings and infrastructure were burnt, along with two neighboring homes. Visible in the photos here, we posit that the metal roof, strawbale walls, wrap around porch supported by fire-salvaged redwood posts, and ample defensible space all contributed in saving the house, and possibly lives. The photos were provided by the owner, Edward Doody. He has kindly agreed to let us make the plans of his home available to other fire victims free of charge. These plans include the engineering courtesy of our office partners Verdant Structural Engineers. Michel Couvreaux, of TransMineral, supplier of NHL plaster, shared these photos of the home just after the burn. He noted that the pink hue was due to the high heat of the flames drawing out iron oxides that occur naturally in the NHL. One the soot was brushed off the walls they were as good as new and their long term durability was in no way compromised. A video of the home just after the fire is here (the house is most prominently featured at 3:00, 8:30 and 9:30). 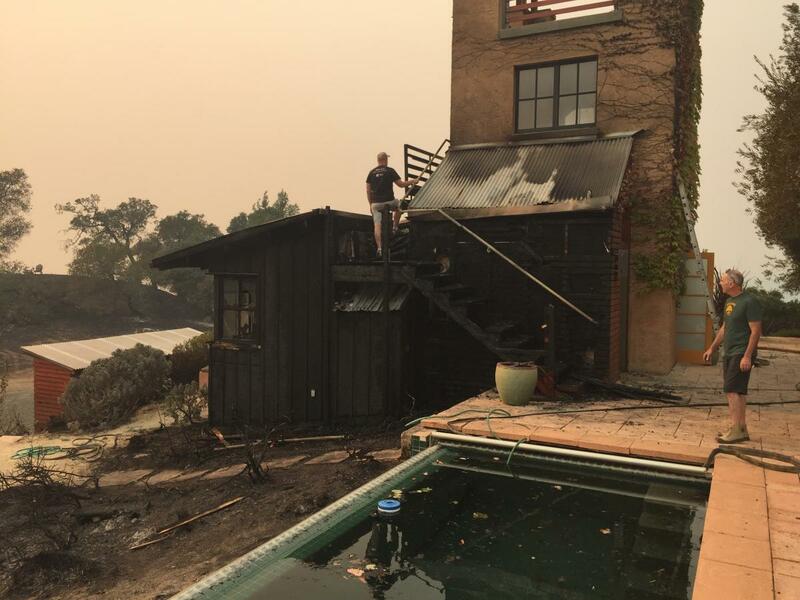 Robert Sinskey Vineyards, in the Stags Lead District of Napa, had the fire literally at its doorstep, and they lost an older home on an adjacent parcel, but the main winery building where our work occurred stands unscathed. A remote strawbale studio—also in Napa—was lost when the wind-whipped Atlas fire approached it from the southeast, which featured a wood trellis and wood framed walls near the ground in that same direction. The owner noted that the straw inside the PISE walls was the last to burn, and only did so because the wood cap at the tops of the walls was breached after the rest of the structure had already burned. The owner’s main house—with an addition featuring strawbale walls—survived. 'Tip-Top’, a PISE home in Napa County suffered damage to a wood-framed portion before the local firefighting crew saved it (pictured below). We have made eight projects available for free to fire victims. Read our announcement about the free plan sets, and write to us at info@arkintilt.com for more information.